It’s relatively easy to head into any grocery store and walk down the cleaning aisle and see a whole wall of products – from toilet cleaner to all purpose spray, disinfectant, granite cleaner, washer machine cleaner, dishwasher detergent, dishwasher cleaner, and fabric spray – the list could go on and on. Many of those products are capable of cleaning surfaces of all varieties – including germs and bacteria – but it’s not necessarily the best route. You’ll be so much better off if you forego the toxic cleaners with skin irritants, carcinogens, health and safety concerns and a long list of ingredients including poison warnings. Scary to know that we use these items day in and day out around the house – on the counters, in the bathrooms, and on surfaces that our children touch. The beauty of making your own home products is that you don’t have to drive anywhere, buckle in kids, wait for store sales, or risk your health. You can merely open up your cabinet and whip your own cleaner together relatively quickly. By using essential oils like Eucalyptus, and Tea Tree you can still get those powerful cleaning properties without the worry – you can have the scent of your choice and the effectiveness of regular cleaners for a fraction of the price. Tea Tree Essential Oil: Known for it’s powerful cleansing properties. Eucalyptus Essential Oil: Eucalyptus oil has a wonderful fresh, clean fragrance, and is known for it’s powerful cleansing properties. 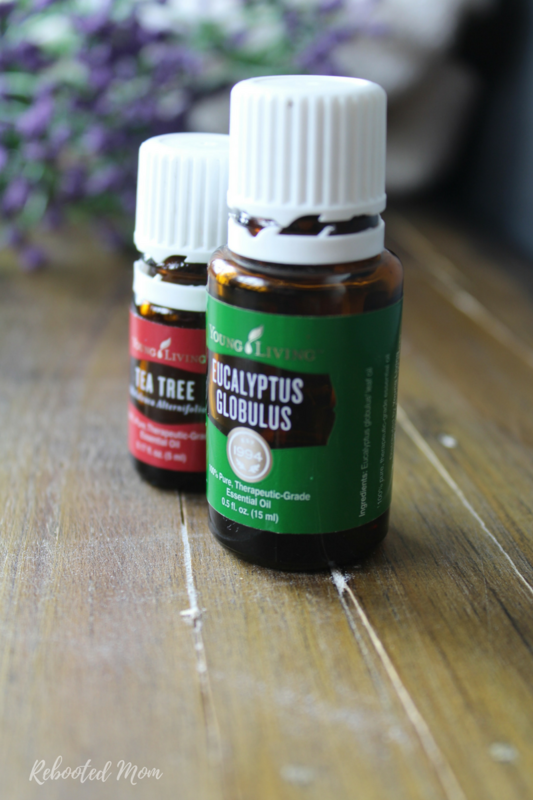 We used Eucalyptus Globulus, although Young Living has 3 varieties of Eucalyptus available. Hydrogen Peroxide: Composed of water and oxygen. It kills microorganisms by oxidizing them – when it reacts with organic material it breaks down into oxygen and water, and is relatively safe for general use. You can pick it up at any drugstore or grocery store diluted to a 3% concentration – and you always want to try to keep it out of direct sunlight. Vinegar is always super popular with all purpose cleaners, but it is acidic and can affect granite – not to mention that vinegar is made of corn … and over 80% of the corn in the U.S. is genetically modified and sprayed with pesticide. Combining Vinegar and Castile Soap is not a wise choice either – as vinegar is acidic, and castile soap will unsoapify – therefore rending eachother useless when paired and used for cleaning. Vinegar is not safe for granite or marble as it is highly acidic, and therefore not the best choice for stone tile either. (If you have granite see our post HERE for an easy DIY Granite Cleaner). 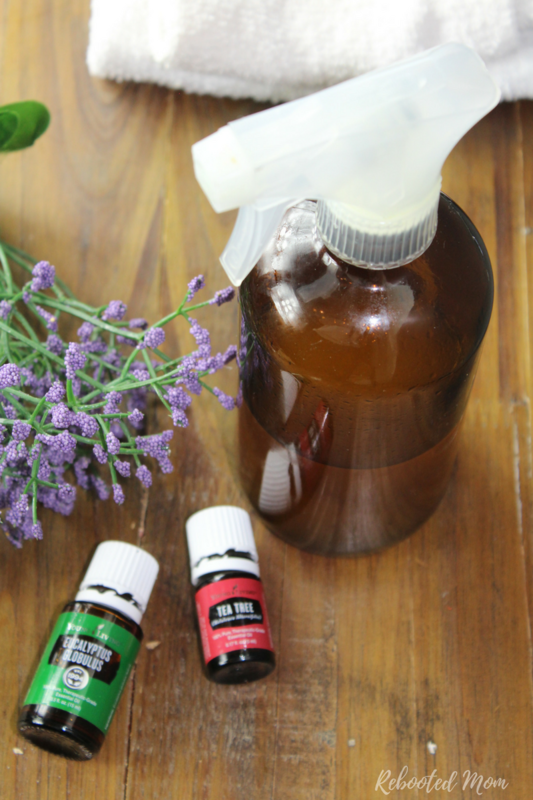 Add the castile soap to a glass spray bottle, fill with water and add your essential oils. Put the top on and spray to combine – that is it! *Disclosure: A glass spray bottle is a wonderful option – it can be reused, and is a safe way to use essential oils. We have 5 kids here and having glass spray bottles hasn’t ever been an issue for us. We recommend Young Living Essential Oils – simply because they have full transparency of their farms – the ability to visit in person, help with the harvest, and they have been around longer than any other company. We love the fact that they are actively involved with their oils from Seed to Seal. 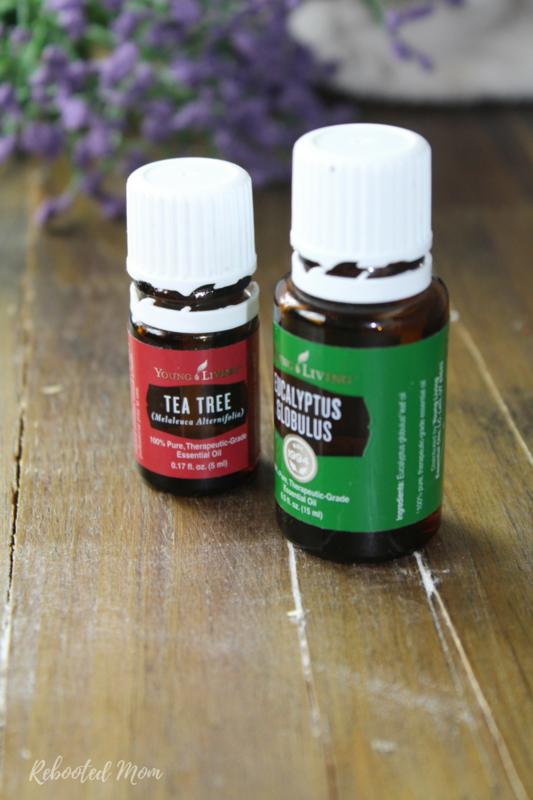 Share the post "Tea Tree & Eucalyptus All Purpose Cleaner"